The PureSteam Duo Iron & Pressurized Garment Steamer is a compact but powerful steamer that lets you hang or hold clothes and loose fabrics securely on its attached rack and board. The hot vapors produced readily remove tough wrinkles from most cloth items, leaving linens crisp but treating silk and delicate fabrics gently enough. Many busy people dislike ironing but strive to look professional without wearing wrinkled stuff to work. One of the best ways to freshen clothes quickly, steam refreshes delicate items, bedding, curtains, upholstery. An upright steamer is particularly convenient for deodorizing loose fabrics and tablecloths. These machines are also good for eradicating bed bugs and sanitizing bedding naturally without leaving stains or toxic residue. When properly applied, steam can restore all kinds of shirts or pants in usually a few minutes. Jeans and polos are readily steamed and pressed without leaving any marks on the shirts. Everything is sanitized as well, for the heat quickly eliminates most bacteria and various other germs. With a little brushing between bursts of steam, you can press and cleanse as you go if you are not doing a huge amount of clothing and drapes. The job was best done with windows open, as clouds of heated vapor can fill the immediate surroundings whenever steam is output for long. This model is designed as a compact steam ironing system with a board fixed to its rack frame. The housing weighs some 19 lbs. and once folded up is narrow enough to be stored in low and tight spaces around small apartments or dorm quarters. Assembly is relatively quick and free of problems. You can readily move the whole frame about without it bending or twisting much as it is carried about. The best part is that the entire system can fit into the trunk of most cars when folded up and with legs stowed. The steam head is shaped and applied much like smaller electric irons. Although the unit looks slightly flimsy, it is not a problem to keep the hand steady on the iron. There might be the tiny shake every now and then. On-demand control lets you release steam as needed by engaging the trigger in long bursts. With a light finger on the trigger, steaming can last for up to a half-hour. A lock switch to enable continuous ironing is absent, though. An output dial is located behind the iron’s handle, which can be tricky to check or turn in order to adjust settings. The hose is long enough to reach every part of the ironing board and the steam iron head fits snugly in the holder. A few useful attachments are included, such as a clothes hanger and hook, connecting and telescoping poles, an iron holder, the ironing board and cover, a fabric brush, a cup measure and matching funnel. It would have been nice if there were another extension pole to allow an extra 12-15 inches in height so that long dresses will not drag much on the floor. Also, the ironing board might be too low for some. Shirts laid on it for ironing may touch the ground in parts. There are no means of checking the water level inside the reservoir. But with continuing use, you will eventually get a sense of how fast it gets consumed over time. A generous 5-year warranty covers manufacturing defects and should provide assurance to heavy users. Once powered, the unit will be ready in 5 minutes or so. Steaming can last longer with a lighter touch. Up to 30 minutes of light steam ironing is possible with a full load of water, depending on the types of fabrics being treated. Linen tends to absorb a lot more steam, for instance. The operation is straightforward. After first unlocking the cap, you fill the water reservoir. The provided funnel and matching cup together makes this task easier, which really helps in daily use. Return and tighten the cap by pressing down on its top, twisting it until it locks. Switch on the power, then wait 4-5 minutes for the water to start boiling. Once steam is on tap, you can begin by hanging clothes on the rack for quick steaming or laying them on the board for a sharper pressing. Sometimes, spots of water will sputter out of the nozzle when ironing directly on garments. Many users found that letting the unit continue heating for a bit longer can reduce the spitting effect. Otherwise, try straightening out the iron’s cable by stretching out your arm. Hold the nozzle well above the head until the output steadies out and sputtering stops. Other times, the problem is resolved by lifting the head only a few inches and then triggering steam. A drain plug for boiler maintenance is located at the bottom of the housing. Draining excess water can take a bit of work, as you must first disassemble then turn over the unit in order to remove the bottom plug. 1600-Watt heating element generates steam temperature in excess of 200˚F. Traditional steam iron and clothes steamer in a single compact unit with an ironing board that is well-suited to small apartments and dorms. The narrow base weighs about 19 pounds and takes up little space once folded. Integrated 31 x 10 in. ironing board and attached rack allow flexibility in hanging fabrics on the frame or securing them on the board. Rack/frame height is 64 in. and the length is 34 in. when fully extended. Decent 34-ounce water capacity enables extended ironing sessions. The convenient on-demand trigger is built into the handle. The safety mechanism of the reservoir cap prevents it from being opened when pressurized steam or boiling water is present within, which can burst out and cause minor burns. PureSteam’s Duo garnered 3.5 stars on average in Amazon reviews at the time of this review, with many mentions of its flexible qualities as a luggable steam press. Its design may not offer the highest capacity available among steam ironing setups, but it is one of the more affordable and competent steamers available to consumers. However, the ironing board is not full-size, so it is not the best for steaming ample yards of drapery and other loose fabrics. But, for refreshing clothes that have been hanging for way too long or steam pressing your daily shirts or pants and the occasional loose cloth, this standing steamer performs just fine. PureSteam’s Duo Iron & Pressurized Garment Steamer is a nicely designed and flexible system that can handle most light steaming and ironing tasks. On-demand control will allow you to apply bursts of steam as needed. Once folded, the steamer fits in low and narrow spaces for ready storage. The attached ironing board is about half normal size though, it will not be replacing a proper board for those with serious steaming jobs. Those who are serious with irons may not find it their thing, this steamer is more of a space-saving model meant for smaller living spaces. 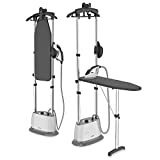 But, if you are like most people on the morning commute and only care for your clothes to look fresh and smoothed, then this steamer will fit the bill. The well-rounded design backed by an industry-leading warranty of 5 years should bring some peace of mind to workaday users over the years.